From Oct. 7, 2008, when the Oconee County Board of Commissioners approved the first beer and wine licenses for restaurants in the county, until Jan. 1 of this year, compliance with two key provisions of the beer and wine ordinance was entirely on the honor system. Starting with renewal applications for this year, license holders were required to fill out a form listing their gross income from total sales, the gross income from the sale of beer and wine, and the resulting percentage of income from beer and wine sales. Those reports have never been checked by an independent audit, and the county still does not try to document that alcoholic beverages are sold only with an order of a meal or an appetizer. The county has never made any secret of its reliance on the license holder to self-police compliance with these key provisions. These provisions and compliance procedures are topics the county will have to grapple with if citizens on Nov. 4 pass a referendum allowing for the sale of liquor by the drink in addition to beer and wine in county restaurants. On Oct. 14 of last year, the county sent restaurant owners wishing to renew their annual licenses for the 2014 calendar year their renewal packets. Included for the first time was a Quarterly Sales Ratio Report. The single-page report asks for gross income from restaurant sales, gross income from the sale of wine and malt beverages, and a calculation of the percentage of sales from wine and malt beverages. Applicants were required to declare that the statements were true and to provide the corresponding Georgia Department of Revenue Sales and Use Tax Form ST-3 for the reporting quarter. On July 30 of this year, the county notified the license holders that the Sales Ratio Report would now be required annually, not quarterly, and as part of the renewal process. New license holders will be required to file quarterly reports until their first renewal. Ten restaurants filed 22 sales ratio reports as of Aug. 22, and in each case the restaurant reported meeting the requirement that not more than 25 percent of sales could come from the sales of beer and wine. I reviewed the reports following an open records request I filed on Aug. 11 with the county. 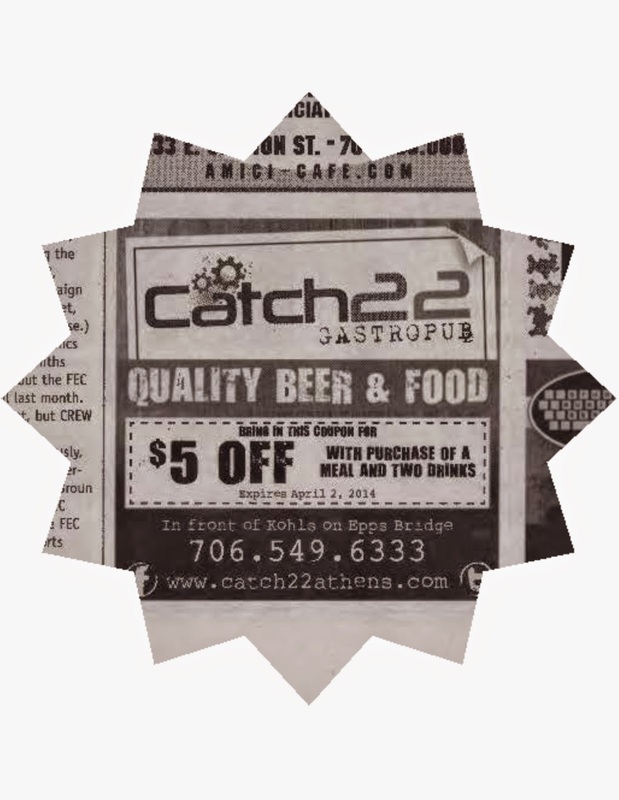 Catch 22, 1021 Parkway Boulevard near Epps Bridge Parkway, which labels itself a “gastropub,” came closest to the limit, reporting that 24.6 percent of its sales were for beer and wine in the last quarter of 2013. Chef Ming’s, 1720 Epps Bridge Parkway near Kroger, reported the lowest ratio. In the last quarter of 2013, according to its filing, only 1.8 percent of sales were for beer. The restaurant does not have a license for the sale of wine. The average ratio across the 22 reports was 8.9 percent of sales coming from beer and wine. A spreadsheet I created summarizing these reports is here. Restaurants filed the required Georgia Department of Revenue Sales and Use Tax Form ST-3 with only 15 of the 22 reports. In two of the 15 cases in which the state tax form was attached, the attached document was only part of the larger form. In one case, the quarterly summary was attached rather than monthly forms. The county sales ratio report document actually asks for a quarterly document, not monthly forms. In one case, University 16 Cinemas, in Epps Bridge Centre, the tax form appears to be for the whole cinema operation, not just for the restaurant. Figures for the restaurant are listed in the sales ratio report. In the first quarter of 2014, University 16 Cinemas reported that 18.9 percent of its food sales were for beer and wine. Only Catch 22's ratio of 24.6 percent for the last quarter of last year and 22.9 percent for the first quarter of this year were higher than the 18.9 percent figure reported for the first quarter of 2014 by University 16 Cinemas. On Dec. 3 of last year, the county issued licenses for seven restaurants for 2014, including for four that had not filed the required state tax forms for the last quarter of 2013. On Dec. 17 the Board of Commissioners approved a license renewal for Dominick's, 1430 Capital Avenue, which had not filed a tax form for the third quarter or for the fourth quarter of 2013. Dominick’s submitted tax forms for the fourth quarter of 2013 on Jan. 17 and for the first quarter of 2014 on May 7. The BOC approved a license for new applicant Taqueria Tsunami in Epps Bridge Centre on Jan. 7, which subsequently did file a tax form for the first quarter of 2014. At that same meeting, the county renewed the license for Acapulcos Mexican Grille, which filed a sales ratio report for the third quarter of 2013, with the accompanying state tax forms, but not a report for the fourth quarter of 2014. The restaurant, which was located at 1260 Mars Hill Road, is no longer open. At present, the county has nine restaurants in the county with alcohol licenses. County Clerk Jane Greathouse, who administers the county wine and malt beverage ordinance, told me the decision to include the sales ratio report with 2014 renewal application materials was made by herself and Board of Commissioners Chairman Melvin Davis. She said that the four voting members of the Board of Commissioners also had been consulted. Greathouse said the decision was the result of a recognition that the number of licenses was increasing and more monitoring was needed. The county was able to do require this report without changing the ordinance, because the ordinance includes the provision that license holders “shall provide evidence satisfactory to the Clerk that such licensee is in full compliance” with the requirement of the law. Greathouse also said when I met with her on Aug. 22 to review the sales ratio reports that the county has never done any spot checks to determine if restaurants are complying with the requirement that no one can order beer or wine in a restaurant without also ordering food. The county’s beer and wine ordinance applies only to the unincorporated parts of the county, and Watkinsville has a separate ordinance that covers the restaurants inside its boundaries. The county ordinance allows restaurants only in restricted areas, defined by a map that is referenced in the ordinance. The nine restaurants at present are tightly clustered, with two of them in Butler’s Crossing and three of them on Capital Avenue in Market Center just west of Butler’s Crossing. Two are in Epps Bridge Center and two are nearby on Epps Bridge Parkway. Taqueria la Parrilla in Market Center was one of the three restaurants in the county to be granted a license on Oct. 7, 2008, when the Board of Commissioners approved the first licenses under the new ordinance. The other two restaurants have gone out of business. A new restaurant and shopping complex is in the works across from the new Athens Ridge student complex on Old Macon Highway. That area is one where the ordinance allows the county to issue a beer and wine license. The county signed a demolition permit for the property on Aug. 26, and the old convenience store already has been torn down. The project, being called Falls of Oconee, also will be readily accessible to students living in River Club, another student housing complex just across McNutt Creek and the Clarke County line at 1005 Macon Highway. Plans call for restaurants, possibly a coffee shop, and other small, speciality stores. Thank you for this comprehensive report. County officials need to be held accountable in seeing that the provisions of the beer and wine ordinance are followed.